Congratulations to Jeff G! 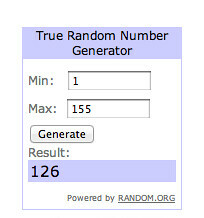 You’re the random drawing winner for the 1,000 AAdvantage Miles and the Marcus Samuelsson cookie. Thanks to everyone that participated! This coming Friday I’ll be giving away a bag of the new Marcus Samuelsson spiced nut mix and another 1,000 AAdvantage Miles. If you spend any time at all in the AAdvantage forum at milepoint, then you’re probably familiar with the very knowledgable and always helpful milepoint Guide, Destination David. When he’s not helping out in the forums, you’ll find him on his blog sharing travel tips, writing about AAdvantage Miles, and following the latest oneword news. Yesterday, he wrote about a new sweepstakes from oneworld member Cathay Pacific: With the winner traveling round-trip to Hong Kong in Cathay’s new Premium Economy seating, which includes more room, wider seats, and upgraded meal service. Check out this post on David’s blog for complete details. • or $100 to spend at the resort’s retail outlet of winner’s choice. The deadline to enter is May 31, 2012 at 11:59 p.m. CDT. Fine print: open only to legal residents of the 50 United States, the District of Columbia, and Puerto Rico who are 18 years of age or older at the time of entry. Even if you’re not a big gambler, you’ll find things to see, like the World’s Largest Collection of Mardi Gras costumers at the Mardi Gras Museum of Imperial Calcasieu. Go here to submit your entry and for full terms and conditions. @ Naïf – Thank you for reading! So? I assume the 50k miles are meant to be used to trade in for airfare? Assuming a milesAAver award is available. Or did I somehow miss air accomodations in the rules? @ Victor – That’s correct. They use miles rather than a (more flexible) travel voucher. Thanks for reading! I’d love the 2 rounds of golf…but I’m sure if we win my wife will convince me to pick the massage!